Many women experience occasional periods of the winter blues. But when it's more than occasional and seems to happen over and over again during the fall and winter months, you may have seasonal affective disorder (SAD). If this sounds like you, don't worry. SAD is common—and it's treatable with the help of sunshine lamps. Lack of energy including increased fatigue, an increased need for sleep and lethargy. Increased appetite, possible weight gain and increased cravings for sugar and carbs. Withdrawal from friends and family, relationship problems, loss of libido and anxiety. Problems with focusing or concentrating on various types of tasks or at work. An increase in the symptoms of premenstrual syndrome (PMS) or premenstrual dysphoric disorder (PMDD). Feeling depressed during fall and winter. If you experience severe depression with SAD, it's imperative that you receive an evaluation of your symptoms so that a proper diagnosis is made. While the symptoms of major depression are consistent from morning to night, the severity of the symptoms of SAD, such as depression and fatigue, increase throughout the day. Where you live is an important factor to consider: people who live in far northern regions of the Northern hemisphere or in extreme southern regions of the Southern hemisphere are more likely to experience SAD. Shorter daylight hours and the reduced amount of sunlight to the retina causes SAD. This is because sunshine increases the body's production of serotonin, a neurotransmitter that helps balance mood, and increased levels of melatonin, a hormone that regulates sleep and wake cycles. Together, these seasonal fluctuations cause seasonal affective disorder in some people. If you have SAD, your doctor may prescribe medication or refer you to a therapist. Another option is light therapy. 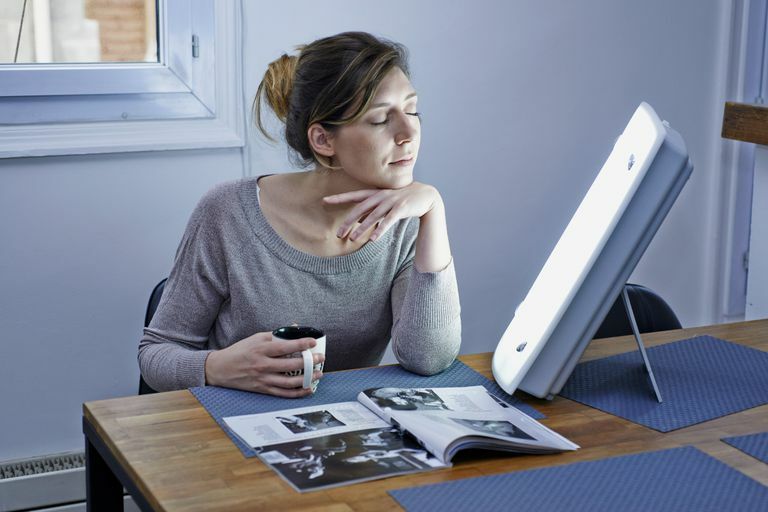 A preferred treatment for SAD, light therapy is effective for 60 to 80 percent of patients, with most noticing a significant improvement within four to five days. Special light boxes, designed for light therapy, can be purchased at many major home retail stores and online. In order to be effective, the lamp should have a power rating of at least 10,000 lux, which is equivalent to five to twenty times the normal lighting in your home or office. SAD lamps should be used every day during the peak seasons in which this disorder occurs. For effective treatment, you'll need to sit in front of your light therapy lamp from 30 minutes to two hours daily. You'll notice the lightbox is very, very bright, so try not to look directly at it. Try reading, watching TV, working on your computer, or anything else you can do while sitting. Although most people prefer to use their lamps when they wake up in the morning, you can also do this in the evening. The time you pick to do your seasonal affective disorder treatment depends on you and the time of day that you feel it's most effective. You may also find it helpful to set an automatic timer to start the lamp two hours before you wake up in order to create a natural sunrise effect. Light therapy can help you live life to the fullest in fall and winter, instead of just getting by until spring rolls around. Eat a low-fat diet that includes an adequate amount of protein, but not an excessive amount of protein. You should also eliminate sugar and carbs as much as possible. Some find taking vitamins that contain magnesium, B complex, and minerals is helpful. The elimination of caffeine may also help. Remember caffeine is in most sodas, coffee, tea, and chocolate. Increasing your amount of daily exercise increases your level of dopamines, as well as your energy level. Easy ways to implement increased activity in your daily life include walking, jogging, and aerobics. If your case of SAD is mild, try increasing the lighting in your home -- leave the lights on instead of always turning them off to lower your utility bill. And whenever it's sunny outside, spending extra time outdoors is often helpful. Don't forget to see your health care professional if SAD symptoms or depression are causing problems in either your personal or professional life. In addition to light therapy, both anti-depressants and counseling are often effective methods for treating seasonal affective disorder.